What are the steps of Custom Swimming Pool Construction? Many of our homes in the desert belong to a Homeowners Association. 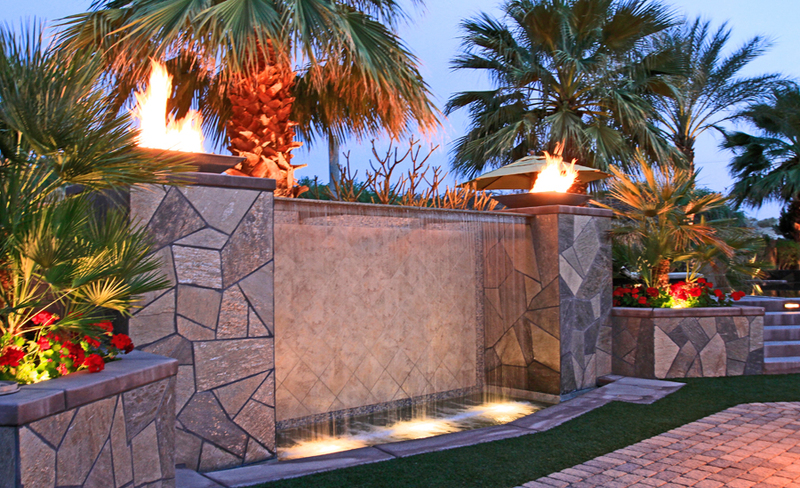 Azure Pools & Spas will help submit the plans for the HOA for approval. 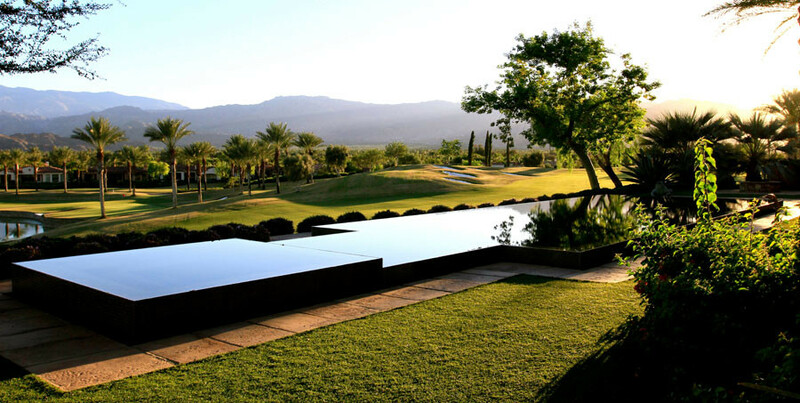 Once the approval is obtained (if there is an HOA), then it is time for Azure Pools & Spas to acquire the proper permits, which are issued by the city, or county in which you live. Prior to excavation, the pool will need to be laid out, this is where our crews will mark out on the ground where the pool is going to be located per plan. If needed, minor changes may happen at this time to make sure the pool / spa is in the perfect location. Once the pool / spa is laid out; forms are set and we prepare for excavation. This is an exciting time as you will begin to see your backyard take the shape of your swimming pool right before your eyes. Within the forms, excavation and soil removal begins by use of a backhoe, bobcat or mini bobcat, to cut the precise shape and curvature. The actual hole will be 6” larger than the finished dimensions in all directions. Reinforcement bar is tied to form a mesh framework on the floor and walls of your pool. There will be Rebar on the bottom of the pool, up the sides around the skimmer, and into the bond beam. Spacers insure the Rebar is suspended above the ground and not against the dirt floor of the pool (Rebar in the walls are spaced from the dirt sides, accordingly). This system allows gunite to be suspended between the bars and evenly distributed under, around, and above the rebar. Although weak in appearance, Rebar is the strength of your pool when combined with the powerful components in gunite. Mall tie wire merely holds the bars in place temporarily until the gunite is applied. Plumbing can get complicated depending on the features you have chosen. Plumbing is a crucial part of the process and that is when experts like ours make all the difference. The rough in allows major components of the plumbing and electrical parts are properly installed inside the wall and through the steel. Non-corrosive S-40 PVC plumbing and fittings will be used throughout your pool / spa and extending to the pool equipment area. All of the plumbing is kept under pressure for the duration of construction to ensure no leaks are present. Gunite is pneumatically applied which is a spraying process to create the pool shell. 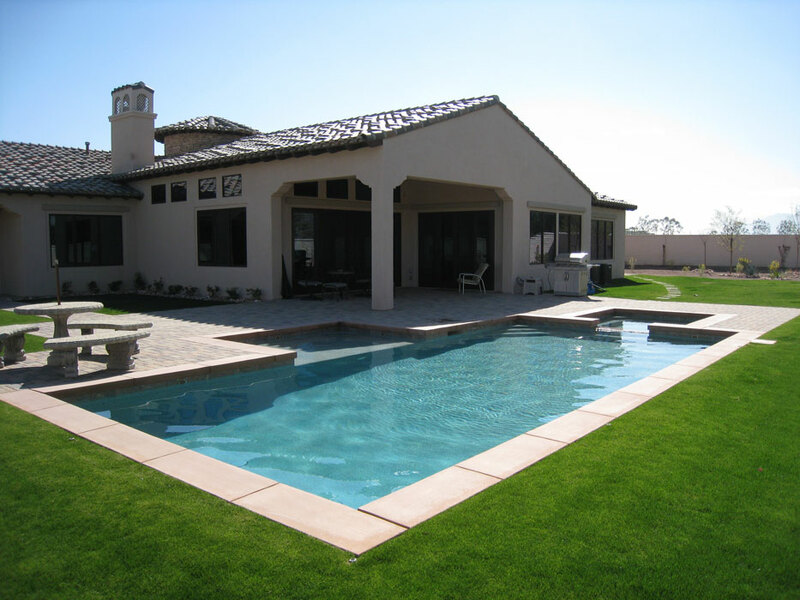 The pool shell implies the base flooring, wall areas, and bond beam of your pool. By strict specifications, gunite is applied to both sides of the Rebar to suspend the bars within the walls and floor to form a solid structure. The decking that surrounds your pool can be concrete, stone or pavers. Concrete decking is the least expensive of the options. 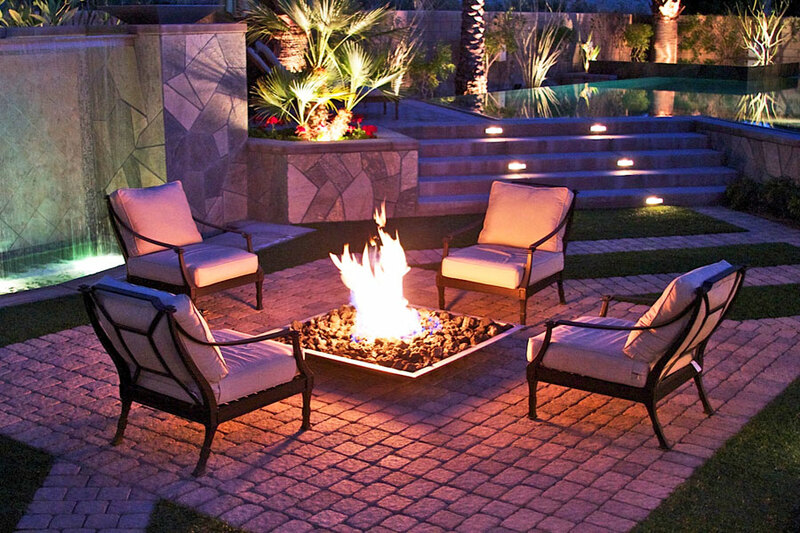 The minimum amount of concrete is a band typically about 15” to 18” wide to cover the top of the bond beam (gunite shell), or we can extend the patio out from the house to create a nice outdoor living area for tables and chairs. Salt and light broom finish are the standard finishes while there are other options such as sand, acid washed or stamped concrete. Pavers are also an option, which a concrete band is usually poured around the pool. Tile or stone is installed after the decking. The top 6” of the pool referred to as the “waterline” is most often finished in tile. We recommend a 6”x6” tile which can be easily cleaned due to the hard water deposits found on pool tile. However, other sizes and types are used from time to time. Also, a natural cut quartzite stone finish is available as well. Other areas that have tile or stone are the spillways, exterior of the spa if the spa is raised and the face of the raised bond beam (raised pool wall) if there is one. Azure Pools & Spas uses top of the line Pentair or Jandy pool equipment. We prefer to use a variable speed pump on all applications of pool and spa unless there are better options. Salt systems are a popular choice in the desert to make the chlorine a natural type of chlorine rather than a harsh chemical, which also fights algae. The equipment is set and anchored to a concrete pad. The electrical is started a day or so after the equipment is set and takes a day or two to complete depending on the system. The final phase is the interior finish which is atheistically pleasing as well as the water proofing for your pool. White Plaster finish is the least expensive while we offer a grey plaster as well with a slight upgrade cost. And Pebble finish is a great option and fantastic investment for your pool. Not only are there more color options, it is just a more durable product. Plaster is pneumatically applied in two coats then hand troweled to a non-slip waterproof surface. When the plaster is complete we will immediately begin filling the pool and/or spa with a garden hose. You will need to fill your pool until the water level reaches the center of the tile (the parameter tile located at the top edge of your pool) or to the center of the skimmer. Your pool is then full and you may turn off the water. Do not turn the water off during the fill as this may cause a bathtub like ring to occur and stain your pool. is a two day process. The first day, a pebble application is shot onto the shell of the pool. Then, on the second day, the pool will be acid washed. Immediately after the acid wash the crew will begin filling the pool and/or spa. Again, use the garden hose for this fill in the same process described above. Do not turn the water off during the fill as this may cause a bathtub like ring to occur and stain your pool. Once the pool is full of water, we will need to start up the pool equipment. This includes initial programming of automation and filling the equipment with water. Plaster pools have a delicate 10 day start up process where the start up person will brush vacuum the pool everyday (except Sundays) for 10 days. While this process is taking place, the pool cannot be used as tempting as it may be. Once the start up professional stays it is okay to swim, you may jump in! With pebble finish pools, the surface is much more durable and may be used right away. A final punch list will be obtained from owner and addressed and the final clean up of the job site will take place. We will schedule an orientation to go over the equipment and an on-site tutorial of how to use your new pool / spa. 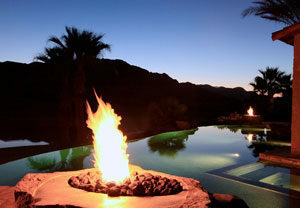 Finally, we sincerely thank you for choosing Azure Pools & Spas, Inc. to build your dream pool! We hope that you have enjoyed your experience as much as we did! We always love to get pictures of our awesome projects once the landscaping has been completed and a testimonial if you would like to be a part of that, just let us know!!! Call us today for a in-home evaluation. 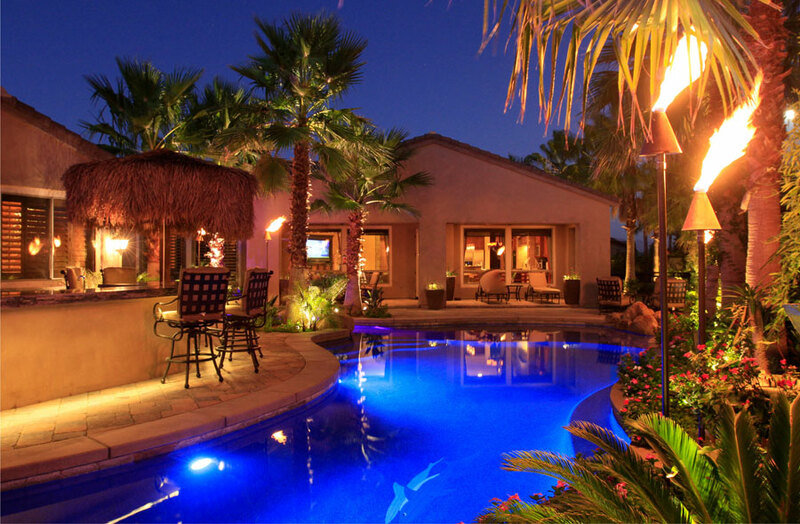 We provide new pool construction services to all Palm Desert, Palm Springs, Indio, Rancho Mirage, Indian Wells, Bermuda Dunes, La Quinta and Cathedral City.